We're only at lesson 3, and I've said it a few times; while making tiny bears, accuracy is everything. When I look over a bear to see whether it was neatly made, one of the first things that I check are the paws and footpads. Whenever things come in pairs, they should match. It is the mark of an accomplished bear maker that they sew and stuff the paws and feet of their bear so that they have the same shape and symmetry, and form a matching pair. See what I mean about the footpads? Once you've noticed, it will not stop bothering you. Stuffing has a role to play, but before we get to that it is important to sew the footpads and paws symmetrically into the arms and legs. In this picture you can see that I marked my pattern cutting lines with a brown pen. I used a blue air soluble pen to draw in the sewing line on each pattern piece before I cut them out. 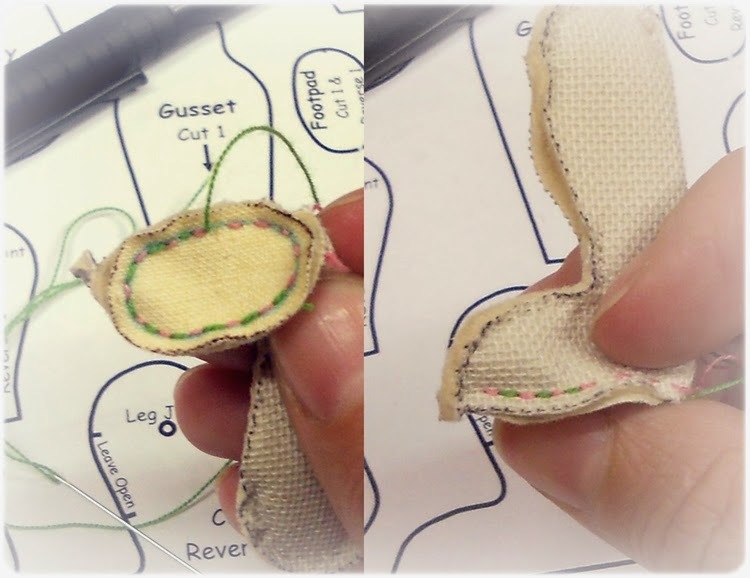 When I sew the footpad into the foot, I use the pen line to help me align each stitch perfectly. You can see my stitches in pink. I use a small running stitch to sew tiny bears together, also sometimes called stab stitch. I know that many bear makers prefer to back stitch, but I find that the 'loops' resulting on one side of the work causes seams not to pull tight properly, and often you will see the sewing thread in the seams when you start stuffing the bear. When I have done one row of stitches around, I go around the footpad a second time, filling in the gaps. I changed to green thread so that you can see the second line of stitches. When using stab stitch, both sides of the seam look alike. A word about threads and pens - in these tutorials you will often see me using coloured threads and dark coloured pens. This is so that the techniques I am demonstrating will show up in the photos. When marking pattern pieces on to fabric for real, I like to use gel pens, because they do not bleed or smudge. They come in many colours. Always use the lightest colour that still shows up well on the fabric. This way you will eliminate the risk of pen lines showing through on the right side of the fabric when you stuff the bear. We will talk more about threads in a future lesson. Try to use thread that matches the colour of the fabric as closely as possible. You can draw the sewing line onto all the pattern pieces of the bear if you like, but I don't usually find that necessary. I do usually sew twice around all my mini bear seams though. Sewing twice around the seams not only makes them sturdy, it helps with another problem that miniature bear makers often encounter. Sometimes the seams will appear to be perfectly sewn but once you stuff the bear, the seams become 'scalloped' and look unattractive. Sewing twice around each pattern piece, making sure to pull the sewing thread tight as I go along, I have managed to eliminate this problem completely when making small bears. This is my book page for lesson 3. I have made a few page templates if you would like to copy mine, but it could also be fun to make your own. Every week, you will find printable templates for Project 52 HERE . Liezel shared her book cover with us. She is a teddy bear designer, computer and music teacher, and mother of three girls. Her homework is always done. In the studio we call her the Head Girl. 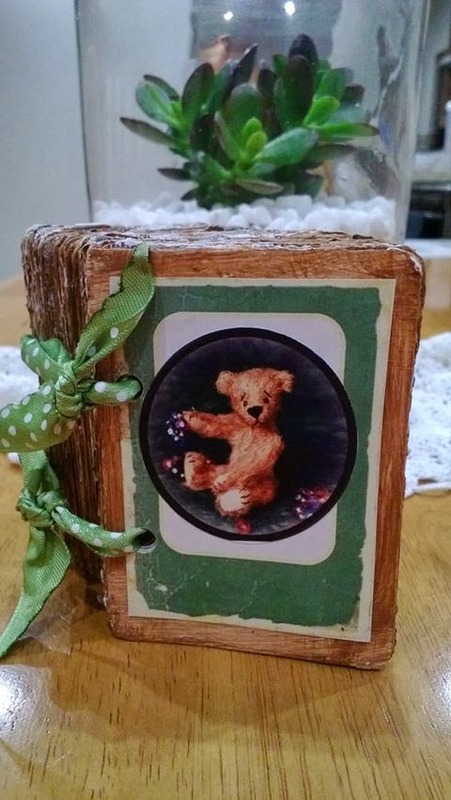 You will find Liezel's designs in her Etsy Shop, and at Bresbears on the Tin Soldiers Website. You are keeping your self busy with all these tutorials. I'm so enjoying sharing the things I have learned over the years, Kay. If it is helpful to other bear makers once in a while, I would be happy.